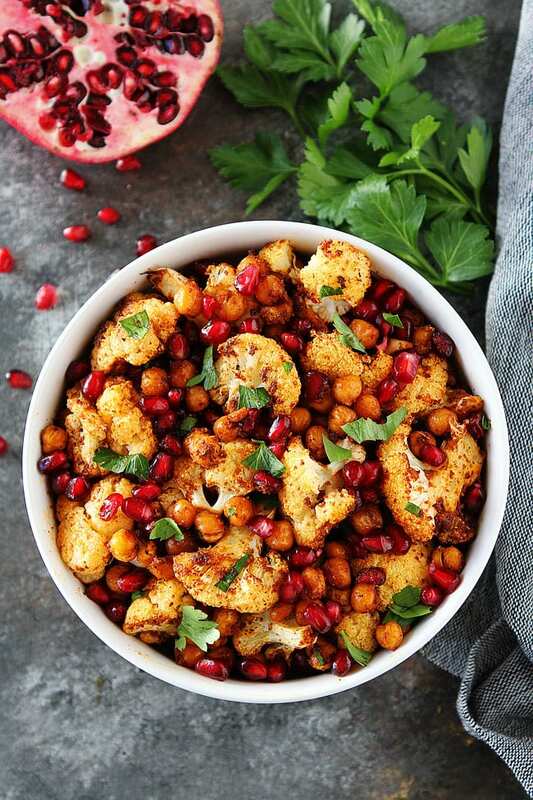 Roasted Cauliflower with Chickpeas and Pomegranate-this easy, healthy side dish is perfect for Thanksgiving and Christmas. It is easy to make, pretty to serve, and delicious to eat! I am all about indulging during the holidays, but sometimes you just need a break from all of the heavy holiday foods. 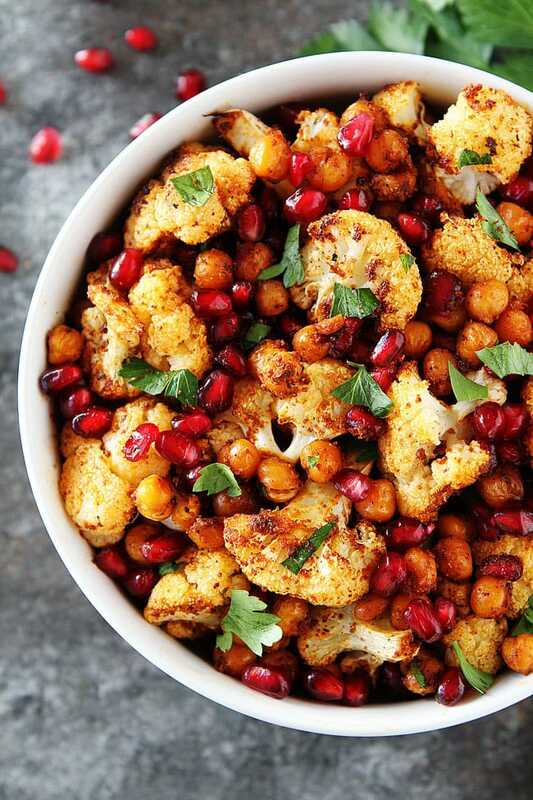 But don’t worry, healthy can be delicious too, especially when Roasted Cauliflower with Chickpeas and Pomegranate is on the menu. Not only is this healthy holiday side dish delicious, but it is pretty too. It is the perfect festive recipe for the holidays. 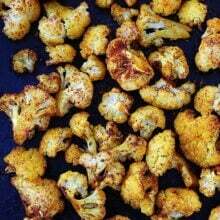 I love this roasted cauliflower recipe because it is super easy to make, which is a big time bonus during the busy holiday months. The chickpeas add protein to the dish and are SO good roasted. 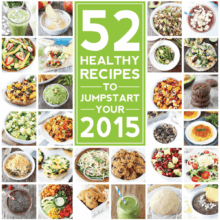 I am always looking for ways to add pulses. Pulses are the delicious, protein-packed, sustainable foods known as dry peas, chickpeas, lentils and beans. The cauliflower and chickpeas are spiced with spices you already have in your pantry. I add a little olive oil and fresh lemon juice with the spices and roast the cauliflower and chickpeas until they are a little crispy. When they come out of the oven I garnish with fresh parsley and pomegranate arils. 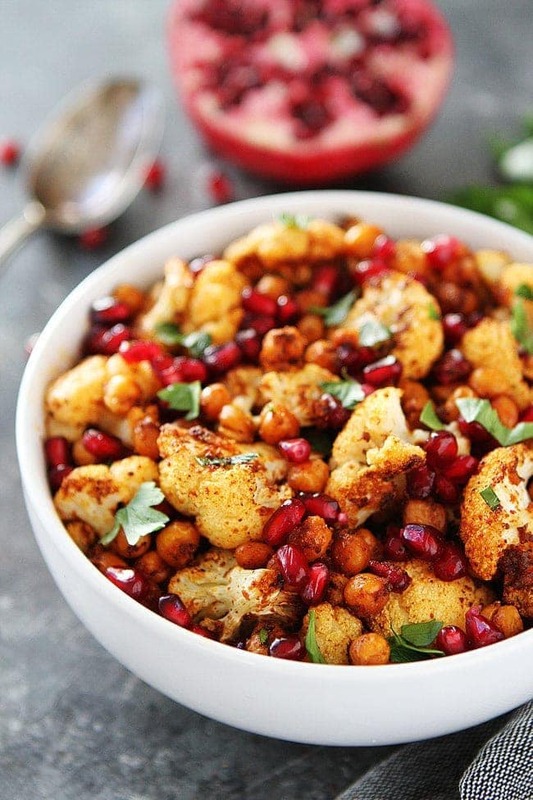 The pomegranate arils add a pretty pop of color and burst of juiciness to the dish. They are refreshing with all of the spices too. This easy holiday side dish is vegan, gluten-free, and a healthy holiday favorite! If you want you can serve the dish over a bed of greens and turn it into a salad or just serve it up as is! It is great either way! 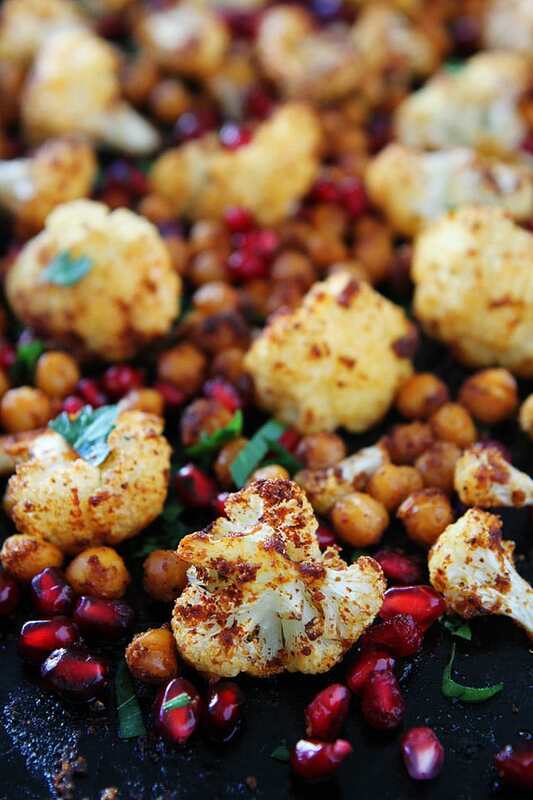 There are never leftovers of this Roasted Cauliflower with Chickpeas and Pomegranate dish at our holiday meal. Everyone loves it! Add it to your holiday menu now! 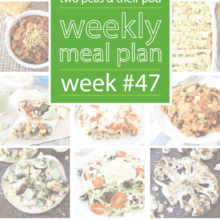 And, if you’re a chickpea fan, you can sign up for the free Half-Cup Habit challenge, and see how easy it can be to add ½ cup serving of pulses to your diet three times a week for added nutrients. This easy, healthy side dish is a holiday favorite! Serve it at your Thanksgiving or Christmas dinner. Place cauliflower florets and chickpeas in a large bowl. Add the garlic powder, cumin, paprika, chili powder, and salt. Drizzle with olive oil and fresh lemon juice. Stir until the cauliflower and chickpeas are well coated. Place on a large baking sheet and bake for 45 minute or until the cauliflower and chickpeas are slightly crisp. Remove from the oven and add the pomegranate arils and fresh parsley. Serve immediately. 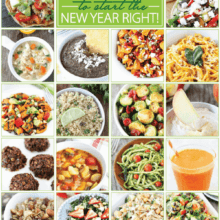 31 Healthy Recipes to Start 2014 Right! 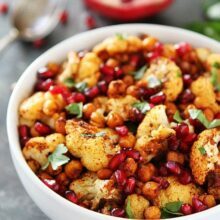 Cauliflower is one of my favorite vegetables and I love to prepare/serve it in a variety of different ways and this recipe looks and sounds great and is so unique! It is so good! I hope you like it! Okay, so I wasn’t sure about the mixture of cauliflower & pomegranates but….. it works. So different than anything I’ve tried before . Thank you for sharing. Halved the recipe and made it for lunch. It is fantastic! I’ve been drooling over this ever since I spotted it the other day. The cauliflower looks PERFECT! And love those pomegranate seeds – so festive! These are such awesome flavors! I need more pomegranate arils in my life! Seriously for the nutritional benefits, so thank you for this recipe, like the cumin and chickpeas too! This looks great for a healthy holiday side dish! Sounds so delicious! I LOVE anything with pomegranates around the holidays – so festive! This dish is beautiful Maria- I would eat that any night of the week or happily serve on a special occasion!